September 2018 - Full review of Governance policy., PDF printable version added to document web links. Provide facilities for, and encourage, study and research. Encourage the advancement and development of knowledge, and its application. Provide courses of study or instruction (at the levels of achievement the Senate considers appropriate) to meet the needs of the community. Provide facilities and resources for the wellbeing of the University’s staff, students and other persons undertaking courses at the University. Exploit commercially, for the University’s benefit, a facility or resource of the University, including, for example, study, research or knowledge, or the practical application of study, research or knowledge, belonging to the University, whether alone or with someone else. Perform other functions given to the University under the UQ Act or another Act. The UQ Act also establishes the Senate of the University and recognises it as the University’s governing body. The Senate elects a Chancellor and Deputy Chancellor. The Chancellor presides at meetings of Senate and in the Chancellor’s absence the Deputy Chancellor presides. To enable the Senate to carry out its functions, including its governance responsibilities, the UQ Act grants the Senate wide powers to appoint staff, manage and control the University’s affairs and property and to manage and control finances to promote the University's interests. The positions of the Vice-Chancellor and the President of the Academic Board are also established under the UQ Act. The Vice-Chancellor is the chief executive officer of the University and is also known as the Vice-Chancellor and President, however in this document is called the Vice-Chancellor for clarity. Being a statutory body under the Financial Accountability Act 2009 (QLD), UQ also has compliance obligations under various laws and regulations in force in the State of Queensland relating to financial administration, accounting, controls, management, information and records, auditing and reporting. Provide assurance on University governance, performance, risk management and compliance. 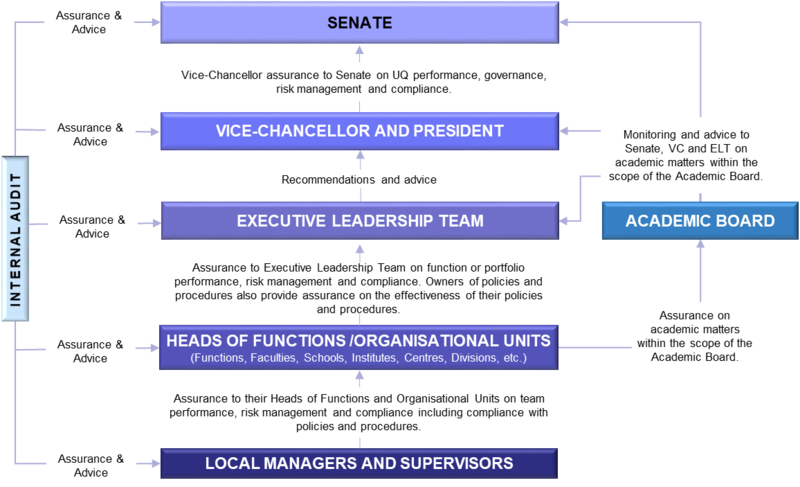 The Governance Framework demonstrates the Senate and management’s commitment to the effective and efficient governance and management of the University. It seeks to enable governance and management responsibilities to be supported and carried out in a planned, organised, coordinated, controlled and transparent manner. The Governance Framework applies to the whole of UQ, including controlled entities (unless they are specifically exempted). Compliance with the Governance Framework is mandatory. Those in control are held to account. Governance at UQ consists of corporate governance and academic governance with the latter focussing on leadership, direction and oversight of UQ’s academic activities (teaching, learning and scholarship, research and research training) at an institutional level. Pursuit of continual improvement and quality assurance. Recognise the strategic significance and contributions of its primary stakeholders including students, staff, benefactors, alumni, peers, partners, government and the local and wider community; protect their rights, and treat them respectfully and equitably. Protect and promote intellectual freedom and ensure integrity and quality in teaching and research. Define and communicate the UQ Mission, Vision, Values and strategic objectives and priorities consistent with its core functions prescribed under the UQ Act. Develop and implement strategic, capital investment and operational plans and budgets, together with prioritised and time-framed programs of work, resource plans, and key performance indicators. Define and implement an organisational structure that ensures the effective and efficient execution of approved plans and programs of work. Provide clarity of roles, responsibilities and accountabilities and assign commensurate authorities and delegations. Ensure equitable, merit-based, transparent, systematic and consistent approaches to staff recruitment, selection, development, promotion and remuneration to attract and retain the most capable staff. Define and implement all reasonable steps to ensure the safety and physical, psychological and emotional wellbeing of its staff, students, visitors, contractors and volunteers throughout all areas of its activities and to meet its workplace health and safety obligations. Enable and ensure planning, prioritisation, procurement, allocation, use and management of its resources in a manner that demonstrates best practice and value for money. The monitoring, tracking and progressive reporting on planned benefits to ensure they are fully realised. Properly account for, manage, maintain and protect its assets, both tangible and intangible, including information and vital records, commensurate with their value, against loss, misuse and unauthorised access or modification. Recognise, assess and efficiently manage risks, consistent with Senate-approved Risk Appetite Statement. Adopt adequate and effective business resilience and incident management procedures and practices to prevent, prepare, respond to and recover from any major adverse risk events. Demonstrably comply with applicable laws, regulations, government policies, mandatory standards, and contractual obligations. Adopt economical, socially responsible and environmentally sustainable practices in all areas of its operations to ensure the University's long-term sustainability, and to protect and where feasible, enhance the natural environment. Create and maintain authentic, reliable and useable information and records to support effective and efficient operations and decision-making and to substantiate University decisions, activities and transactions. Ensure relevant, reliable, timely, balanced and honest disclosures and reporting of University performance and position, both against plans and KPIs, and to meet legal or regulatory reporting and disclosure requirements. Establish and implement effective supervisory, monitoring, review and management assurance activities and promptly rectify any identified discrepancies including unfavourable trends and variances. Develop and continually enhance its people, process and systems capabilities, including where appropriate, through the use of innovative technology. Determine, develop and implement appropriate policies and procedures containing mandatory requirements to enable and ensure effective and efficient governance and management. For staff, compliance with applicable mandatory requirements is a condition of their appointment and continuing employment with the University. For students, compliance with applicable mandatory requirements is a condition of their admission and ongoing enrolment at the University. The Senate Charter outlines how Senate operates to fulfil its functions. Where there is a conflict between the Charter and the provisions of the Act, the Act will prevail. The Charter is supplemented by Standing Orders, approved by Senate, which set out Senate’s processes in more detail. Policies define UQ's position and objective/s on matters of strategic significance and the relevant outputs and outcomes that UQ needs to deliver to achieve its policy objectives. To demonstrate compliance with applicable laws, regulations, mandatory government policies/standards, legal obligations and mandatory professional standards. Policies are categorised into Governance, Academic and Operational policies. The Academic and Operational policies are subordinate to the Governance policies. Governance policies relate to Senate’s reserved powers and governance responsibilities (Senate’s reserved powers are set out in Schedule 1 of the Instrument of Delegation – Delegation to the Vice-Chancellor of Senate’s Powers under the University of Queensland Act 1998). Compliance with Governance policies is mandatory across UQ, and its controlled entities (unless the policy specifically excludes them). Academic policies govern the University’s teaching, learning and research functions and their supporting strategies and activities. Unless reserved by Senate, these policies are approved by the Vice-Chancellor based on advice and recommendations from the relevant member of the Vice-Chancellor’s Committee and after considering any advice from the Academic Board. The Vice-Chancellor may delegate the approval of academic policies to a member of the Vice-Chancellor’s Committee. Compliance with Academic policies is mandatory across UQ, excluding controlled entities (unless the policy specifically includes them). Operational policies govern the University’s corporate/administrative and non-academic functions and their strategies and activities. These policies are approved by the Vice-Chancellor (unless reserved by Senate) based on advice and recommendations from the relevant member of the Vice-Chancellor’s Committee. The Vice-Chancellor may delegate the approval of operational policies to a member of the Vice-Chancellor’s Committee. Compliance with Operational policies is mandatory across UQ, excluding controlled entities (unless the policy specifically includes them). Ownership of policies is determined by reference to the Criteria for Issuing Policies (see section 2.1.2.1 above). The party accountable for achieving the objective/s owns the relevant policy that supports or arises from that objective. Depending on their categorisation, policies are approved either by Senate or by the Vice-Chancellor. The Vice-Chancellor may delegate the approval of academic or operational policies to a member of the Vice-Chancellor’s Committee. Administrative changes to Governance policies are approved by the Vice-Chancellor. Administrative changes to Academic and Operational policies are approved by the policy owners. The policy owner also owns the procedure/s linked to that policy. All policy requirements are principles-based, consistent with legal or regulatory obligations, and their adoption and effectiveness is evidenced and verifiable. All new or revised policies are referred to relevant stakeholders for consultation prior to being issued. Prior endorsement of the Vice-Chancellor's Committee is required for the development of a new policy or to make a significant changes to an existing policy. Procedures describe the processes and activities that realise the outcomes defined in their parent policies. Procedures are categorised based on the categorisation of the parent policy. Approval of some academic and operational procedures may be reserved by the Vice-Chancellor. Academic procedures are approved by the relevant member of the Vice-Chancellor’s Committee after considering any advice from the Academic Board or its subcommittee/s. Operational procedures are approved by the relevant policy owner. New or revised procedures are referred to relevant stakeholders for consultation prior to being approved and issued. Compliance with procedures is mandatory across UQ, excluding UQ's controlled entities (unless they are specifically included). Local Standard Operating Procedures (LSOPs) are step-by-step instructions to enable the correct, consistent and efficient undertaking of particular tasks/activities at a local level. LSOPs are consistent with relevant policies and procedures. The structure and content of LSOPs is decided by the issuing manager and may be customised to best meet the local area’s needs. LSOPs may be mandatory for the local area. If mandatory, they will be notated as such and protocols will be implemented to provide assurance on their effectiveness. Be based on approved document templates for policies and procedures (see Appendix A and Appendix B) and written in plain language. The Senate is the University’s governing body and accountable for the effective and efficient governance of the University. The Senate responsibilities are outlined in the UQ Act and Senate Charter. The Senate Charter also highlights the Committees that Senate has established to assist in the discharge of its obligations. The Vice-Chancellor is the chief executive officer of the University and is responsible to the Senate for executive decisions and the overall management and performance of the University. The Vice-Chancellor is supported by a number of management committees, all of which have their own Terms of Reference. The functions of the Academic Board are further elaborated in the Academic Board Policy. Protecting and enhancing UQ’s value. In addition to the above responsibilities, the enabling functions and divisions (corporate functions and academic support services) are responsible for assisting the core academic functions of research and teaching through provision of systems, support, training and advice. Under the oversight and direction of Senate, the Vice-Chancellor and the Executive Leadership Team, monitoring and reviews are undertaken at different levels of the University to provide assurance on performance, governance, risk management and compliance. The following figure illustrates these levels and relevant assurance responsibilities. The oversight, monitoring and review responsibilities of each of these groups are set out below. The Senate is the University’s governing body and accountable for the effective and efficient governance of the University. The Vice-Chancellor provides assurance to Senate on UQ’s performance, governance, risk management and compliance. Exercising management oversight responsibility, monitoring enterprise performance, governance, risk management and compliance, and ensuring any deficiencies are promptly remedied. The Academic Board is responsible for monitoring the academic activities of the University and providing advice to Senate, the Vice-Chancellor and the Executive Leadership Team on academic matters within the scope of the Academic Board. Monitoring, reviewing and providing assurance on portfolio performance and the effectiveness of controls to manage risks and demonstrate compliance and remedying any deficiencies. Heads of organisational units who are owners of governance instruments (policies and procedures) are also responsible for monitoring, assessing and providing assurance on the effectiveness of their policies and procedures and remedying any deficiencies. Monitoring, reviewing and providing assurance on team performance including risk management and compliance and remedying any deficiencies. Internal Audit is responsible for providing objective assurance and advice to Senate, the Vice-Chancellor, Executive Leadership Team and managers on performance, governance, risk management and compliance matters, including the manner in which management discharge their monitoring and review responsibilities. Report confirming effective and efficient performance, governance, risk management and compliance associated with their operations and functions. Report confirming each policy and procedure is adequate, effective, and efficient and has continued relevance. Assurance on the adequacy, effectiveness and efficiency of governance, risk management and compliance frameworks, policies and practices at UQ. The Vice-Chancellor is authorised to make changes to the Policy and Procedure document templates as appropriate. Administrative changes include (but are not limited to) correcting patent errors, updating references and links in a policy (e.g. changes in titles of legislation, codes, etc.) and updating a policy to reflect nomenclature or title changes. Administrative changes do not affect or change the overall intent of the policy including its purpose, scope and key requirements.